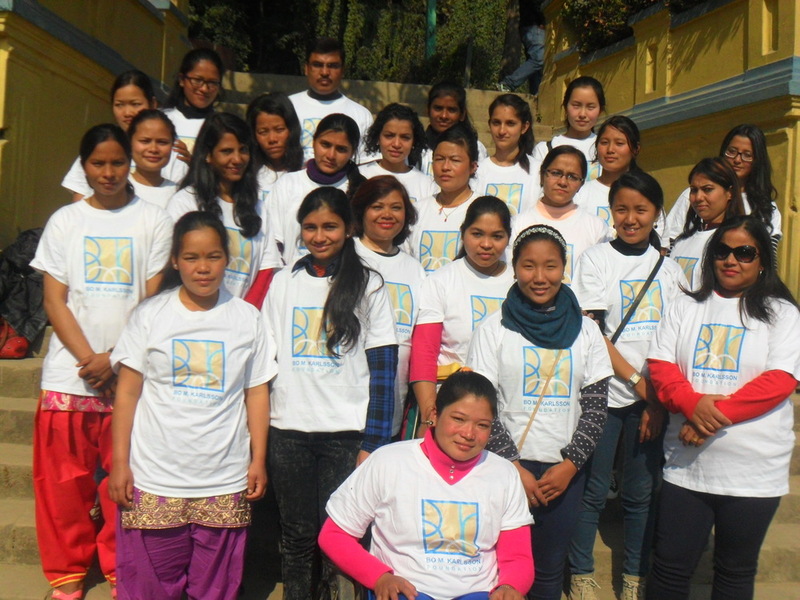 January 2016 — Bo M. Karlsson Foundation scholars and our volunteer board from Mahilaa Sikshya Nidi, BMKF’s Nepal sister organization, gathered earlier this month for a picnic at Balaju Gardens in Kathmandu. Board directors Bimala Manandhar, Om Prakesh, Poonam Karki, and Neema Sherpa ’14 joined program manager Sabita Tamang ’14 to honor 11 BMKF scholars who graduated in 2015 — and to celebrate 14 new and continuing scholarship recipients. This year’s scholar selection process was an international effort. BMKF’s U.S.-based education committee reviewed scholarship applications and then submitted their recommendations to the Nepal board directors for a final decision. Om, Bimala and Sabita interviewed the shortlisted candidates at Nepal Mandala Travels in December. BMKF’s seven continuing scholars include: Babita Sharma (civil engineering), Manisha Sah (business), Indreni Waiba (education), Saraswoti Adhikari (public health) and nursing students Lali Kumari Sunawar, Mandira Upadhyaya and Rebika Bandari. Our new BMKF scholars include Jangmu Sherpa (nursing), Chadani Shrestha (business) and Shanta Bhat (business). We also awarded four unique scholarships funded by individual donors: Lhamu Sherpa received the Pasang Sherpa Teacher Scholarship; Anisha Gautam and Nimiska Pandey each were awarded a Lucile Flanagan Law Scholarship; and Prabha Bohara’s scholarship was funded by BMKF’s education committee members. “As a 32-year-old woman, Prabha is what U.S. colleges refer to as a ‘nontraditional student’ — older than the average undergrad. She made a courageous decision to return to school to advance her career, and we felt compelled to support her,” said education committee co-chair Erin Inclán. Scholarship candidates were selected based on academic merit, application answers, essays and interviews. Each candidate answered a series of questions about her life and goals, including how she plans to help improve the lives of other women in the future. We know these bright young women will continue to inspire us all! Please visit our website and follow us on Facebook as we share more BMKF scholar stories and updates throughout 2016. Special thanks to education committee volunteers Amanda Wager, Erin Inclán, Christine Herbert and Ann Salminen.